Spawning Tool is driven by community-contributed content: without your replays and build order write-ups, the entire website would be browsable in about 30 seconds. Having seen plenty of build orders, we have some patterns and best practices for new contributors to make the build order-writing process as easy and useful as possible. To be honest, it takes forever to write build orders. There are dozens of units, structures, and upgrades to fill in, especially with the supplies and times. Instead, save your self the effort and just use our “Export” feature to grab the build order from an uploaded replay. For example, let’s say you want to write up ByuN’s Reaper opening from the WCS finals. First, find the replay on Spawning Tool. Then, click the tab for ByuN’s build order. 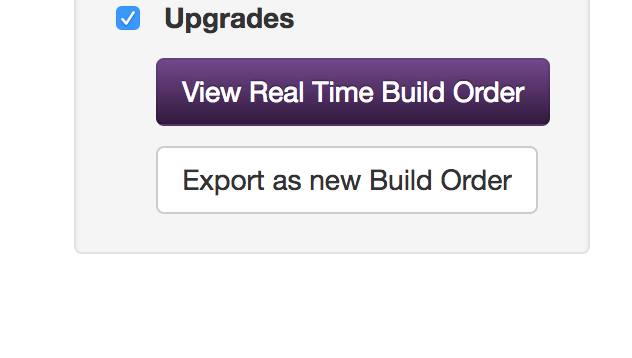 Then, click on “Export as new Build Order”. That’s it! You will land on the first step of creating a build order, and you can fill in the basic details of the build order. When you create it, you will see the steps pulled in and save yourself a ton of time. If you don’t have a build order handy, just start up a custom game against AI and play through the build yourself! I promise it will save a lot of time, and recording exact supplies and times will make the build accessible in the Spawning Tool Build Advisor for others to follow. Let’s say you wanted to write up INnoVation’s 2-1-1 build. You might start by copying this replay where he uses this opening against Scarlett. However, the build as is has over 100 steps, and really, the part you want is over by maybe 4:11 at the latest when he starts his first Medivacs. Although you could just take the entire replay build as is, 100 steps of game-dependent choices is quite overwhelming, and you really only want the opening and the gist of later timings. This “time limit” lets you filter out all of those later steps without having to delete each of the steps by hand. Sometimes, however, you do need the time limit later to catch key tech structures or upgrades, like a 12 minute 4th Command Center. In the meantime, however, you have been building Marines 5 at a time, and that is cluttering up the steps for your build order. Typically, a build order shifts from the opening into the core production, with a note like “continuous Marine production.” Similarly, you don’t need precise timings on Supply Depots: you just need to avoid getting supply blocked. The “filter later steps” removes the 11th (and later) instance of each unit and structure and 6th (and later) instance of each supply building. This reduces the clutter of unit production so that the build order is more focused on key tech timings. This checkbox combines units build within 5 seconds of each other into a single step with a multiplier. It may take a few seconds to select buildings and workers, but the intent is much more clear. We have several required fields for your build order, but plenty more optional fields can be tremendous to making your build order helpful to others. In the description, provide brief context about what the concept of the build order is. Get others interested in why they should try out your build order. In the analysis, explain what it’s actually like to use the build. Mention the strengths, weaknesses, and caveats to the builds. Provide responses to different strategies from your opponent. Link a youtube video for the VOD. As much as we love replays here at Spawning Tool, it’s much easier to see a build in action, and especially if the replay is from a professional game, the casters can fill in context as well. And of course, an example replay is useful, but if you copied the build order from a replay, you should be set anyways. In the build order itself, you can put notes on any of the steps to explain why you built something, where it should be placed, what to do with the unit after it’s completed, or any other context. If you need to do something that is not connected to building something (e.g. “Scout at 1:05”), you can pick the “Action” unit from the build order as a placeholder.